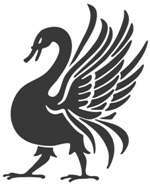 It’s all about the dressing, this week, as Raging Swan Press releases GM’s Miscellany: Urban Dressing and I put the final touches to GM’s Miscellany: Dungeon Dressing! I can sensationally reveal that last week’s beach-visiting plans went rather well. Sadly, this week I don’t have very much actual editing to do so I might fail to spend quite so much time outside enjoying the weather. GM’s Miscellany: Dungeon Dressing: The PDFs of this monster tome are complete! At 336 pages, this is Raging Swan’s biggest book and one anyone who designs their own dungeon should check out. This week, I’ll be taking final delivery of the cover and uploading the whole to my printer. It’s been a long road to get this book finished, but I’m delighted with the result. Random Encounters: Wilderness II: This book is also all but finished. I’ve completed all my edits and now await only the last few designer bios. Once they are in, I can create the final book and send out contracts. I can also prepare to reveal which two lucky designers have won their chance to write a Village Backdrop for Raging Swan Press. GM’s Monthly Miscellany: July 2014: I need to create this product, and decide what material from my Borderland of Adventure campaign I’ll include this month. With season 2 of the campaign finally coming to an end, I’m not short of material! Town Backdrop: Deksport: I’ve failed to get anything done on this in the last week or two, and so this week I *will* make progress on this project. Pathfinder-Focused Articles: I’ve noticed, through the magic of Google Analytics, that the two most popular posts on this blog (Basic Equipment Loads and The Top 10 Pathfinder Arguments) are both Pathfinder-focused. Thus, I’ll be pondering some more Pathfinder articles on similar subjects. If you have a subject you’d like me to tackle, please let me know! 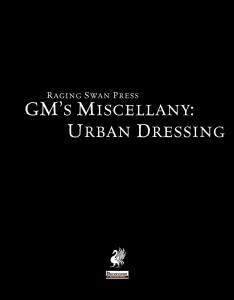 This week, Raging Swan Press releases GM’s Miscellany: Urban Dressing in PDF, soft cover and hardback. To celebrate, I’ll be posting a series of urban-focused articles throughout the week. I hope you find them useful and interesting.